Explore a cidade medieval de Kruja e aproveite os destaques da capital albanesa nesta excursão de dia inteiro. Visite o Castelo Kruja, o Museu de George Kastriot Skanderbeg e o atmosférico Old Bazaar em Kruja; faça um delicioso almoço em estilo albanês em um restaurante local (opcional: por conta do visitante); e visite pontos de interesse como a Praça Skanderbeg, a Torre do Relógio e a Mesquita Et'hem Bey, em Tirana. If you are lucky to get ILIA then you are in for a treat. Excellent guide with fantastic knowledge of area and the country's history with great additional information to make the day so enjoyable and memorable. We are seasoned travellers and this trip and guide was one of the best. Visiting the most interesting buildings and sites, we just wish we had more time to use him for other regions in this surprising country. Bazaar, museums and local restaurant were great. Five star trip and guide. 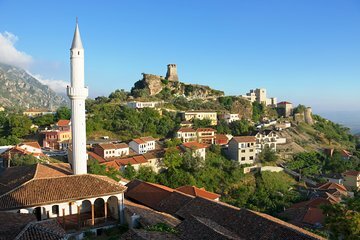 Wonderful tour that gives you plenty of time to see the sights in Kruja...which is definitely one of the highlights to see in Albania. Illir sp? was the perfect tour guide. In addition to really knowing his historical stuff, he was able to share lots of insight about contemporary Albanian culture. He was utterly thorough, professional, and accommodating. If you have a short amount of time in Tirana and want to see the local highlights, this tour is highly recommended. You can't beat it for history, spectacular scenery, and overall fun. Professional and well educated guide that went above and beyond even when the weather wasn't great. A tour with lots to see - not overbearing, but still immersive. Very good tour. Abdul was a good driver and Ed was a good guide. Overall I thought good value tour.